No, it’s not a joke waiting for a punchline. It’s an experiment called The Practice, and it’s the brainchild of Pastor Bill Hybels’ son-in-law, Aaron Niequist. Niequist is also the Worship Pastor at Willow Creek Community Church, and he calls a Jesuit priest his spiritual director. Starting this Sunday, Niequist will teach you about “unforced rhythms of grace,” in which you will learn to align your rhythm with God’s rhythm, practice contemplative prayer methods like Lectio Divina, and learn from a Catholic priest. Note that Niequist does not mention Jesus Christ, the cross, sanctification or any other biblical doctrine as reasons to start The Practice. Just boxes and business management. RHYTHM: Learning to align our rhythms with God’s Eternal Rhythms, for the sake of the world. Already I need to insert this: On 9/20, Niequist has invited New Ager Ruth Haley Barton to teach Sacred Rhythms. What church calendar? Here is The Practice Calendar, in which you are invited to deep dive into a self-assessment of your own rhythms. Next month, you’ll learn the three foundational practices for a life aligned with God: SILENCE, EMBODIED EXAMEN, and SABBATH. “Silence helps us hear God’s still small voice and align with God in each moment of our day. The Examen helps us look back upon each day and find God’s fingerprints in the most unlikely places. Sabbath helps us reorder our days into the rhythm God established in Creation: 6 on and 1 off,” Niequist says. Could it be that Niequist means the Roman Catholic calendar? During the “Examen” phase, a distinctly Catholic element comes into play, with the introduction of Father Michael Sparough, a Jesuit priest who guided The Practice community through the Catholic practice of The Examen. Audio: The Cross Meditation – a ten minute guided meditation on the Sign of the Cross. Teaching: St Ignatius and The Examen – Fr Michael Sparough teaches on the history of The Examen. Teaching: The Five Steps of The Examen – Fr Michael Sparough teaches through the steps of The Examen. Video: A conversation with Fr Michael Sparough and Aaron Niequist about The Examen, spiritual direction, and learning from other Christian traditions. Aaron Niequist is a singer and author, who married Bill and Lyn Hybels’ daughter, author Shauna Niequist, who frequently speaks at women’s retreats and conferences. 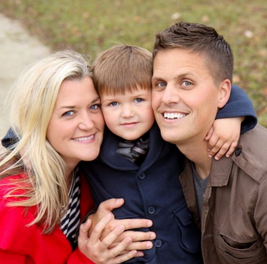 The couple worked for Rob Bell’s Mars Hill church in Michigan, Aaron as his worship music leader, and Shauna as his media relations (PR) guru. 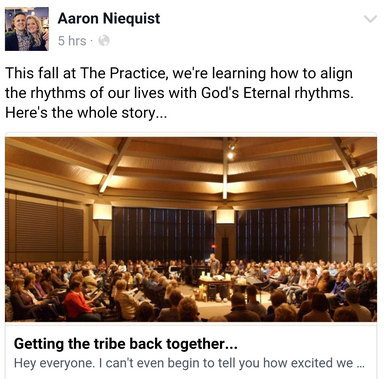 Before The Practice, Aaron’s A New Liturgy project did musically what The Practice is doing …liturgically? Questions about any of the New Age terms you’ve read here? Be sure to study our White Papers for extensive research on New Age, Spiritual Formation, Catholicism (RCC), Contemplative Prayer, and the Emergent Church. War Room’s Priscilla Shirer “will become the main character” in the Bible stories she’s reading?